Listen to this! Yes, we want you to listen to this floor! This is the sound of Blacktex luxury sheet vinyl from Beauflor. Didn’t hear anything? We didn’t either. Turn up the volume on this video and you will hear voices, but only voices. Our footsteps are silent as we walk into the Design Room, an expansive space with high ceilings, located upstairs at the Beauflor mill in Cartersville, Georgia. We were amazed that we were walking on sheet vinyl in our high heels and hard sole shoes and our footsteps were silent. Why is Blacktex so quiet? The innovative, anti-microbial, black textile backing, combined with the foam construction creates a warm, comfortable and quiet walk in the room. So, forget what you know about sheet vinyl. This floor is something completely new. 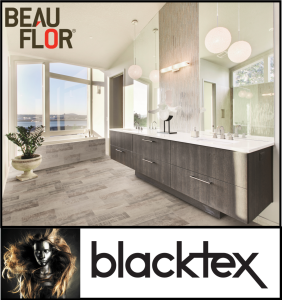 Beauflor brings on-trend style together with innovative manufacturing for a sheet product that is not your grandmother’s kitchen floor! Cool grays and realistic, earthy designs and colors will create a stunning visual in any space where durability and function are a priority. Unlike traditional sheet products, Blacktex will not move, wrinkle or tear. 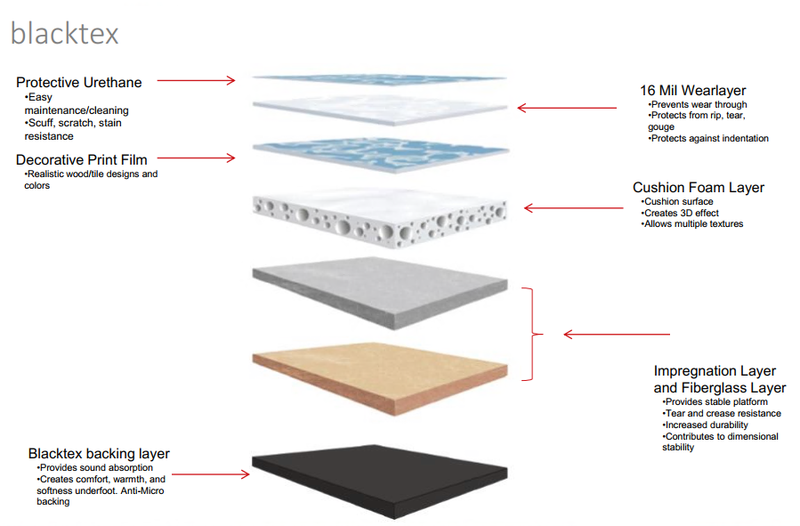 Homeowners can rely on the added rip, tear and gauge warranty and know this product is backed by Beauflor for unsurpassed quality standards. Perfect for families with children, pets and busy lifestyles, Blacktex is waterproof, scuff, stain and wear resistant and cleans up quickly and easily. This vinyl checks all the boxes for style and durability, plus it is 100% recyclable and has no ortho-phthalates, so consumers can feel good about purchasing a healthy and environmentally responsible product. Contact your William M. Bird sales rep for sample and display information. 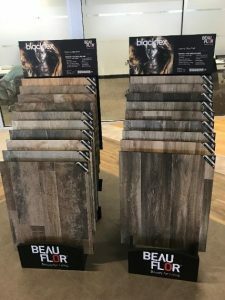 The Beauflor Blacktex display offers a unique visual impact for your showroom!